StackTech is an unconference that brings together technologists from departments across the country. Unlike a traditional conference, attendees pitch ideas on the day and then run sessions. The third StackTech took place at the end of October this year. Summarising an unconference is tricky because it’s an event where thoughts and ideas fly around at breakneck speed. 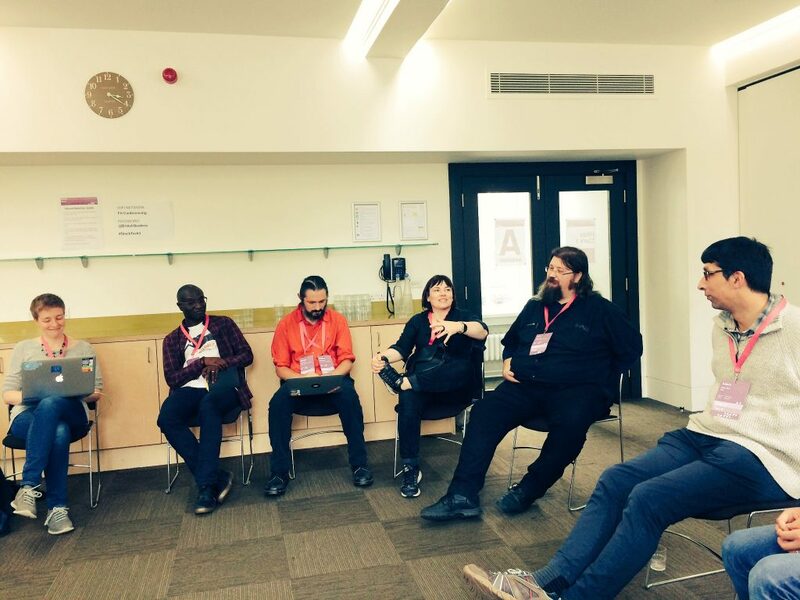 In fact, writing a blog post about an unconference is akin to dancing about architecture, so we'll summarise 10 interesting topics we discussed on the day. Please tell us your thoughts in the comments or write your feedback in another blog post to help improve the way we work across government. We discussed how technologists can be rewarded when they perform well in the Civil Services. All too frequently technologists find their reward is being moved into senior management but it’s clear this is not always a popular aspiration. Some technologists enjoy practising their discipline and want to continue being hands-on. Government departments already have incentives such as in-year bonuses, extra holiday and flexi-time to reward service. How else can we reward staff? Many companies in the private sector implement an employee recognition program and some offer sabbaticals once people have completed a specific period of service. Has your department experimented with any reward schemes? Are there any that tend to specifically appeal to the technology community? Government releases lots of APIs but should we have a process in place to scrutinise them? Benchmarking APIs can help make sure user services meet an agreed standard. However, benchmarking is a time-consuming, expensive process and before deploying it, we’d need to ensure it’s the best use of taxpayer money. There’s also the question of what software we’d use to benchmark and whether we can deploy benchmarking consistently across government. We are currently working on a set of API Standards for government use, encouraging departments and agencies to work to agreed standards. There’s a question of whether a further step using a standardised software test to analyse system performance is practical. Not everyone has superfast broadband. A naval warship has an Internet connection with 2Mbps downstream bandwidth and UK homes have an average broadband speed of 16.5Mbps. Evidence suggests that fast loading times increase user engagement. We know The Telegraph tested the impact of latency on its online readership and found that page views dropped by 44% when page loading times were artificially increased to 20 seconds. Meanwhile, Trainline found its customers spent an extra £8 million per year on bookings when latency on its site was cut to 0.3 seconds. To provide fair and equal access for citizens to government services, we know it’s essential to design for the lowest connection speeds. What can we do to make it easier for all departments across government to design with this in mind? Building native and hybrid mobile apps for government services is not encouraged by the Service Manual as these are expensive and can cause accessibility issues. The Service Manual encourages the adoption of Progressive Web Apps (PWAs) as these provide the benefits of native mobile applications such as push notifications and offline access without impacting accessibility. PWAs are fast, reliable and provide the same level of user experience as a native mobile app. Twitter Lite is a PWA that has improved the user experience and engagement on the social network. Other well-executed examples include GitHub Explorer, Offline Wikipedia and the FT App. Finding ways to reduce the operational cost of new services is a recurring topic at StackTech events. Some attendees expressed interest in using Kubernetes, an open-source platform designed to automate the deployment, scaling, and operation of application containers. While no-one in attendance was running Kubernetes in production, the platform is on its way to becoming the standard for container orchestration with vendors such as AWS, Oracle and Microsoft all supporting it. Do you have any experience with Kubernetes? Let us know your thoughts. Some departments continue to provide documents in proprietary formats such as Word or PDF. Attendees at the StackTech questioned whether the promotion of the ODF standard has failed. With departments moving towards cloud-based editors will the ODF standard even be needed in the future? For example, at GDS we use G Suite and it’s possible to share documents with anyone by providing them with a shareable link they can view in their browser. Do you use proprietary formats, ODF or cloud services in your day-to-day work? Another staff development question considered at StackTech concerned mentoring schemes. Attendees wanted to know what people wanted from mentorship programmes and how departments could best provide this? GDS uses reverse mentoring where younger staff members mentor a senior person. This approach has proved popular. The junior staff mentor gets to ask questions, receive tips about progression at work and find out more about management issues. The senior civil servant gets an insight into workplace culture, team dynamics, thoughts and experiences around learning and development. Does your department have a mentoring scheme in place? Are there any learnings you can share? Visit the GDS office in Whitechapel and you’ll see we love post-it notes! Technically, these count as written documentation and information recorded on these notes is usually photographed or written up. Will the General Data Protection Regulation (GDPR) change the way we work, when it becomes law in May 2018? What's the smallest unit of information that civil servants need to retain under GDPR? Should we record all our phone calls? What about conversations over coffee? GDS is working with the Cabinet Office to help provide guidance on this subject. The Civil Service should reflect the whole society. There are already plenty of initiatives across government to help increase the number of civil servants from black, asian and minority ethnic (BAME). backgrounds. For example at GDS, we ensure there is a BAME representative on every interview panel. To attract more women into developer roles we make sure all our job adverts are gender neutral by using the Textio and Gender Decoder software tools. But more needs to be done. How do we ensure that more women and minorities take roles at a senior level? Should we exchange ideas with governments around the world to help solve this issue? Blockchain is one of the most discussed technologies on the market. One of the main advantages of blockchain is that it provides a record of every transaction, which cannot be changed or deleted. This characteristic means blockchain has many practical applications within government. Attendees discussed the practicalities of using blockchain for government services and thought about its potential. For example, electronic voting, identity and healthcare management are potential use cases. There are still practical and security issues of blockchain that need addressing before rollout within this government is possible. For example, will citizens trust a government-provided distributed ledger? If you have thoughts on the topics raised at StackTech3 do leave comments and suggestions below. If you want to come and work with us you can also apply for a job at GDS.